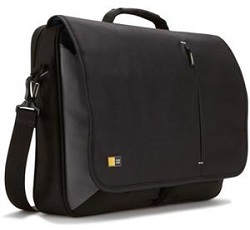 Get contemporary messenger styling with convenient top-load access for laptops with up to a 17" screen. Roomy storage underneath flap for files, power brick and other bulk storage needs. Accessory pockets for portable mouse, iPod, cell phone and pens in secure front wall zipper compartment. Integrated neoprene USB drive pocket. Removable shoulder strap and padded handle. Luggage strap securely attaches messenger bag to most rolling luggage. Minimum Screen Size Supported: 15"